January | 2013 | Extollagy! …. then, while researching something else, a headline that reminds me of an arguement I myself have made — click through and lo if it’s not a right wing thinktank Downunder reviewing the same book by yours truly (not that he says much at all about the book itself)! 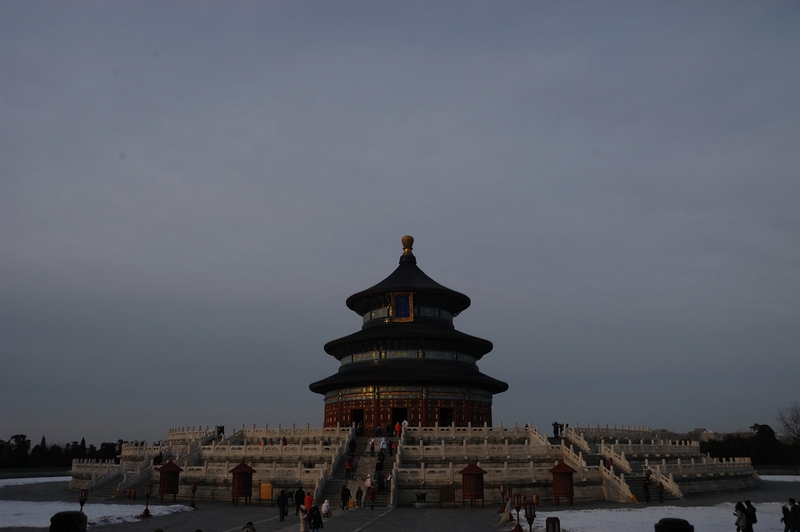 I had intended to go down there at 5.15am, which is when, on the Winter Solstice, the emperor would have left his Palace of Abstinence within the enclosure of Tiantan, the Temple of Heaven, and headed for the sacrificial altars at the heart of this complex. The ‘temple’, really a complex of interlinked roofed and open-air ritual sites (and today a museum), is not open that early , but I wondered if a tiny and elderly crowd might form there, or someone unlock a side gate for a huddled group to rush in. After all, this sacrificial event is marked out in texts, the Zhou Li or Rituals of Zhou, that go back some three thousand years and from them it is clear that this, the Winter solstice sacrifice at the imperial altar in the southern suburbs of the capital city, was the most significant single event in the entire religious calendar of the empire. A grand rite on which man’s relationship with the universe depended. There must be one or two battered and elderly residents of Beijing who remember and honour this, relatives, perhaps, of the Manchu dynasty and its court, or devotees of a Confucianism which is today the least prominent of China’s traditional faiths…. even if it was last performed in earnest almost exactly a century ago. Not that anyone but an emperor can perform the sacrifice for it to have been valid. Yet without it, the contract of man and heaven, of people and cosmos, falls apart. In any case, the emperor’s silk-lined finery must have been heavily insulated, for even at 3pm, when we finally arrive, the cold is minus 10 and biting, razor-sharp in its intensity, with mounds of hard-packed snow against the bone-white marble of the altar platforms. How 64 dancers, a host of courtiers, and the many butchers and other specialists prepared themselves at that twilit hour and in that temperature, I can only guess. Animals, thundering along the sharp orthogonal turns of the corridor built for them, from in-temple to farm to in-temple slaughter house, oblivious to an imminent and steaming fate. Enormous masts, from which long lanterns shift in the wind, throwing flickering and shadowy light onto the proceedings, reassuring the populace that the holy contract is sealed. A figures moving around on frozen platforms. It is easy to misread this place. The Hall of Prayer for Good Harvests (itself renamed many times, possibly rarely used, and certainly the result of centuries of ritual reinterpretation and prevarication between construction of the complex in the 1420s and the end of sacrifices here in the early C20) is the best known building in the complex, and arguably the best known building in China. Yet it is an oddity, a circular roofed building covering the surface of the uppermost level of a sacrifical altar, a building of a type only occasionally repeated elsewhere, and never to the same design. None of the other surviving imperial altars of China have buildings on them, and as far as I know, at any one moment no other architecturally expressed open-air altars existed: this is exclusively an architecture of emperors, replaced and rebuilt on new designs each time the dynasty changed and the capital moved, the most reincarnation of an ancient tradition. 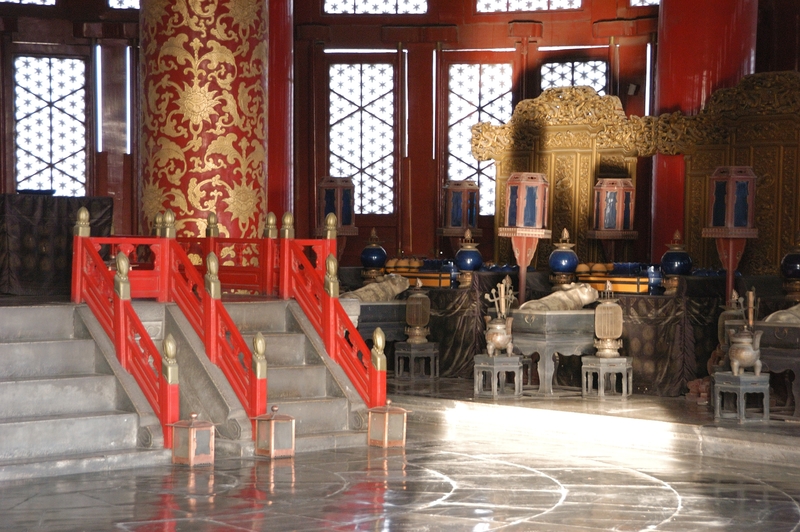 Because it looks like a temple, and is very beautiful, this Hall receives all the attention: unlike the Circular Mound Altar, to which it is joined by a 360-metre long, raised processional way. Yet it is the latter that mattered most. This ‘building’, in turn, looks like what it is: a sacrifical, open-air religious structure, a primeval form of ritual setting made into a work of elegant architecture. It is simply a series of flat, tiered circular platforms, structure, rather like the take-off point for a rocket ship, or — more to the point — one of the great open air circular ritual complexes of the ancient world, such as Avebury or Stonehenge. Perhaps the ritual architecture of the West, then, would have ended up looking like this, if continuity rather than energetic reform and dogmatic rejection of the past had marked our religious history. Which brings me to why this place matters to the wider world of architecture and religion. Chinese religious architecture is unique. All the other major world cultures at some point demoted their open air altars and sacred landscapes, replacing them with (or placing within them in a manner that made the building, rather than the place, the focus of attention) permanent, roofed structures of stone which were invariably also the most ambitious buildings that culture created. China did not. It kept building such complexes, albeit only for the use of the emperor itself. And its other religious buildings are generally of wood, and for all their beauty and grandeur, small in scale compared to (say) Angkor Wat, Srirangam, Karnak or Cologne, and basically identical to other kinds of Chinese building. There is no special architectural language for the temple, as there is for the mosque, the church, the Hindu temple, the stupa. Its survivals are also rarely very old: the Hall of Prayer for Good Harvests was last rebuilt in 1889, using American timbers because Chinese ones of appropriate size could not be sourced; each of its various rebuildings since 1420 (itself ‘recent’ by global standards for major religious buildings) has also changed its design. 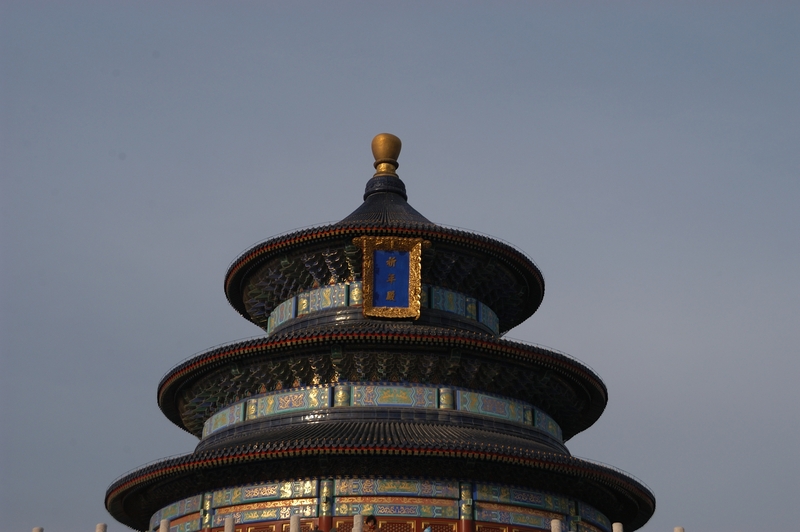 But here, and in the four other surviving such complexes positioned on the cardinal points around Beijing, Chinese imperial ritual architecture took the ancient principle of the open air sacred complex and preserved and continually reinvented it into the modern era. 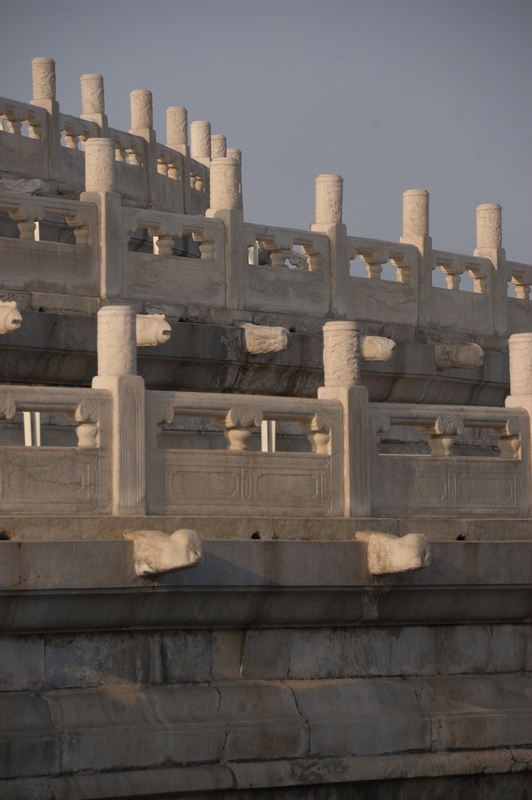 These altars, then, are China’s one unique and indigenous contribution to religious architecture. In this they, for all their rarity, are as significant a form as the church, the mosque, the synagogue, the Hindu temple and the Buddhist stupa. The latter, in its sinicised form as the pagoda, is China’s other main claimant to this status: but the pagoda,, though far more ubiquitous in the Chinese landscape than the sacrificial altar, was as an adapted foreign form for an adapted foreign faith, and thus more a regional variant on someone else’s architecture than the unique architectural expression of an indigenous tradition: in other words, the pagoda is a sinicised stupa; the imperial sacrificial altar is as unique to its ritual tradition as a church or a mosque). And even more significantly, once the south American temples and altars had been closed, such complexes were the only example in world architecture in which the open air sacrificial/ritual complex, arguably the birthplace of religious architecture of all kinds, survived, uniquely as and a permanent and sophisticated building type. So it’s worth a visit, even on a freezing afternoon, on 21 December 2012. Hard sunlight shines off the sweeping blue-tiled roofs of the Hall of Prayer for Good Harvests, and throws low winter light onto the ritual implements stored inside it. Both here and at the Circular Mound Altar, a great glazed platform and a series of metal ritual stands were used to cook and send to heaven the scents and smokes of various animals, and later to burn the implements used in the rituals and send their scents to heaven, too. Inside, a veritable banquet of the gods was laid out, and Chinese prescriptions for events here reveal the rich, and very Chinese, delight in the smell, textures and flavours of the sacrifical animals alongside the more arcane laws, of a kind familiar in many cultures, about how, when and where to perform this or that prescription, so as best to please Heaven and the gods. Though it is off-season, this building is one of China’s must-sees, and groups of tourists both Chinese and foreign move around the enclosure. No one shows any awareness of the significance of the day. Leaving the gates that set this temple aside within the wider complex, and moving along the processional path towards the Circular Mound Altar, people reach the small, circular Imperial Vault of Heaven, where they troop up and down the steps and numbly view the tablets within. These embodied the spirits of various imperial ancestors, and — raised high above the others in a niche — Shangdi, the Godhead itself. They would be moved temporarily to whichever of the two main altars was to be used for a given ritual, the calligraphy they bear somehow bringing with it the the spirits evoked themselves. This idea, that the writing of a word is sufficient to embody a deity, is also very emblematic of Chinese culture, in which the written word assumes a cultural significance and artistic importance matched only by that of written Arabic for Muslim cultures. The Wintere Solstic ritual, of course, took place at the Circular Mound altar, built in 1532 and reconstructed by the Qianlong emperor in 1751-2: it’s near-abstract beauty, with each finely cut piece of blank marble playing a role in a complex numerology of the turning year (there are said to be 360 stone panels on the balustrades, for example), and its simple rising broad series of platforms are a powerful sequence to inhabit and climb. 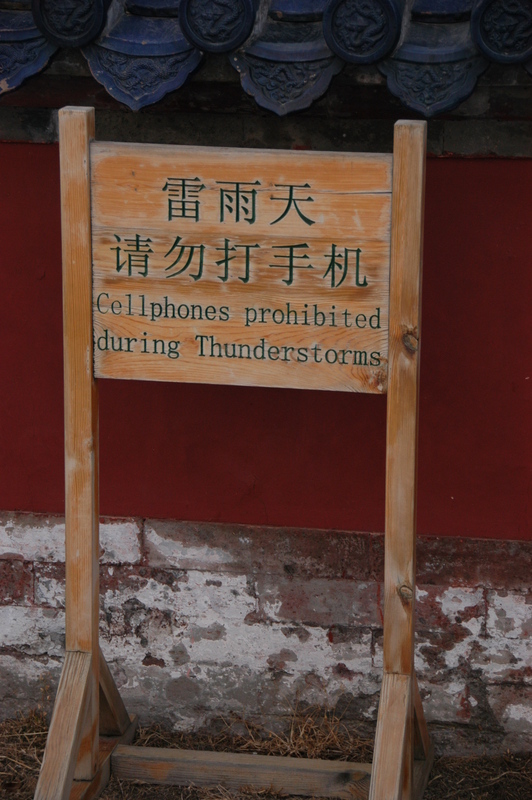 Signs suggest a curious official nervousness about this place: cellphones prohibited during thunderstorms. The circular mound altar also sits within a gated enclosure, which is square, symbolising the earth, in contrast to the circular and heavenly form within. The red enclosing walls, with their honorific gates, look out onto a giant parkland, part of the temple complex, and in one direction, open out onto the din of Beijing traffic. A hard grey light presses down as the sun sets, and something bright is lying in one of the stoves adjacent to the altar itself. I walk over. 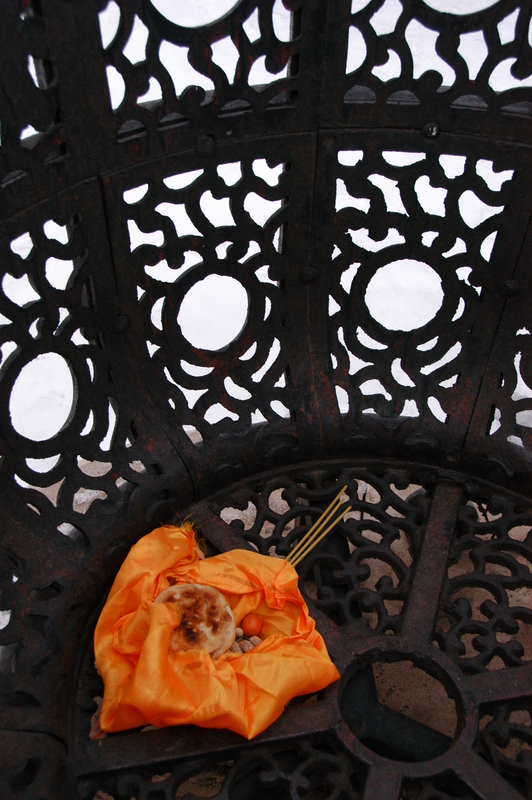 A band of yellow silk; some incense sticks; some food (nutes; an orange; some sweetmeats), all freshly left. The day has not been forgotten. Was this the discrete act of some closet devotee of the Rituals of Zhou? Can its location, in the stoves rather than on the altar, be ascribed to a desire to honour the spirit of the emperor rather than to maintain some connection to a sacrifice which, after all, only he could have performed? Was there an attempt to light these items on this cold, hard day, an attempt thwarted by some discrete but vigilant official, watching out for a lone pensioner’s ritual insurrection? Or has one of the rookie soldiers in ill-fitting uniforms who ‘gaurd’ the complex been slipped a few yuan to put his lighter to it after the park has closed? I’ll never know. As light falls, groups of hardy people are singing popular songs and playing cards in the passageway along which the animals thundered to their fate. The Palace of Abstinence has closed for the night, its moat is empty. The vast park is said to be planted with 3,000 cypress trees, a great grid in the middle of this mighty city; yet few are of any age. Occasionally a raven caws, a reminder off the curious rarity of birds here. The stillness becomes intense, almost eerie, as if all of us are to be plunged into a deep freeze: such a scenario, would perhaps have been seen as the most dangerous corollary of the cessation of sacrifice here, for with man’s contract with heaven broken, there was no need for the year to turn at all. A great ritual winter would fall over the city of concrete. Cold Wars and Second Ice Ages would ensue: they did, perhaps they will. Perhaps the upheavals of the twentieth century can be ascribed to the lack of an old man in heavily padded silk, surrounded by castrated courtiers, offering the smoke of cooked meats to invisible spirits on a circular platform. But it feels oddly safe here, as if History itself has been frozen out of the atmosphere.